As if the Lamborghini Centenario wasn't already striking enough. The latest example of Lamborghini’s limited-run Centenario supercar has rolled off the production line and will be delivered to its new owner in Hong Kong. Only 40 examples will be built divided into 10 coupes and 10 convertibles. A few months ago, the in a unique Blue Nethuns color scheme over a bare carbon fiber body. As if the rare supercar wasn't already striking enough, the owner of this latest example wanted to stand out even more and had their Centenario finished in bright green Verde Bronte with a bespoke matte finish. We think you’ll agree that the result is absolutely stunning. As a finishing touch, the unique green finish is contrasted with a bare carbon fiber trim and gold carbon fiber accents on the roof, engine cover, side mirrors, lower bodywork and rear wing. Even the wheels get the gold treatment, thanks to that allows you to personalize your supercar to make it truly unique. The Centenario's Nero Ade black interior is just as lavish, as the cabin is coated with copious amounts of Alcantara as well as bright green lining and gold carbon fiber accents that match the extravagant exterior. 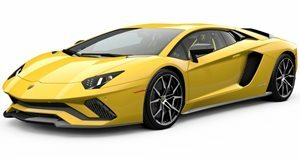 Before the owner takes delivery of their Centenario, the supercar will be displayed at Lamborghini's Hong Kong showroom on October 18 to mark its grand opening. The owner of this unique Lamborghini Centenario shouldn’t be disappointed with its performance. It’s powered by a naturally-aspirated V12 that produces 759 hp and 507 lb-ft of torque, resulting in a 0-62 mph time of 2.8 seconds. Thanks to a power-to-weight ratio of 1.97 kg/hp, the Centenario only needs 23.5 seconds to get from 0-186 mph before topping out at 217 mph.